Looking for some healthy treats for your pet rabbit? Or are you not sure whether your bunny can eat certain types of food. In order to help you make an informed decision, we have created a list of food items and whether it is a good idea to feed them to rabbits or not. Before going over the different food items, there are some basic rabbit feeding aspects we need to cover. 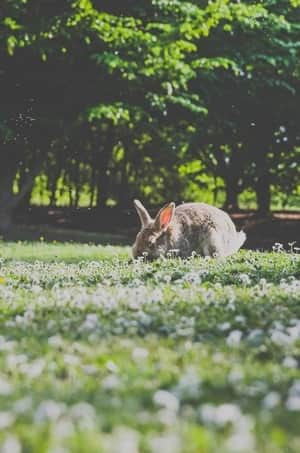 In general, the best foods for rabbits are those that provide the nutrients, minerals, and vitamins a bunny needs for healthy growth and development. Most of these foods are actually similar to what wild rabbits will consume on their own (grass, forbs, and leafy weeds). The most important item in a rabbit’s diet is fresh hay (dried grass) and it should be available in constant and abundant quantities. Hay will provide your rabbit with the essential fiber to maintain a healthy gut movement. It also helps wearing down a rabbit’s teeth which continuously grow. Fresh vegetables are also key as they provide additional nutrients to the diet. The bulk of these vegetables should be leafy greens which help keep intestinal contents hydrated, making them easier to pass. On top of that, they will provide different tastes and textures for your long-eared friend to enjoy. Offer around 2 cups of chopped vegetables per 6 lbs (=3 kg) of body weight per day and include around 3 to 6 types of vegetables. 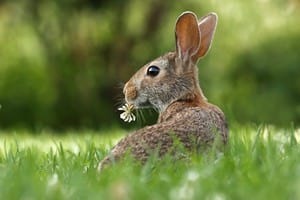 As a general rule of thumb, any leafy green that is safe for a human or a horse to eat is safe for a rabbit to consume. But there are some exceptions as we will see further down below. Rabbit pellets provide a concentrated source of nutrients, vitamins, and minerals that a rabbit might not get if only fed hay and vegetables. However, only a small amount of pellets is needed to assure a healthy rabbit. Make sure to use good quality pellets and avoid muesli-style mixes. Fruits are to be considered as treats and should be offered in very limited quantities. As a general rule no more than 1 tablespoon per 2 lbs (=1 kg) of body weight per day. While fruit is a source of minerals and vitamins, it also contains a lot of natural sugars. Feeding your bunny too much fruit might lead to intestinal problems in the short term, as well as abnormal weight gain or other health problems in the long term. Last but not least we want to stress the importance of providing your rabbit access to fresh drinking water all day round. If a rabbit is deprived of water, ingested food becomes dry and difficult to push through. This, in turn, can lead to a condition known as ileus, which can be life-threatening if not recognized and treated. Disclaimer: the list below is by no means exhaustive. If you’re unsure about feeding a rabbit a certain type of food, our best advice is to just not do it. While doing our research, we have tried to come up with a list of lots of alternatives. If you know of other food items that your rabbit really enjoys let us know in the comments section below. We’ll dive into the details below, but to help you get an overview we’ve also put everything in a helpful infographic that answers the question: What do rabbits eat? This wraps up our list on what rabbits can eat. What are your experiences with feeding bunnies? Any food item we missed that you like to see covered? Did you like our infographic?